The beginning of the Horticultural Society movement in Canada dates back to May 1st, 1834 when the first Canadian Horticultural Society was founded in the Town of York, now the City of Toronto. This Toronto Horticultural Society is officially recognized as Ontario's oldest Society. An history site plaque was placed in Allen Gardens in Toronto on June 10th, 1964. The plaque reads "founded in 1834 under the patronage of Sir John Colbourne, Lieutenant Governor of Upper Canada." This was the first Horticultural Society established in this province. It was established to encourage the introduction and cultivation of improved varieties of fruits, plants and vegetables. Its first president was the Honourable George Markland, Inspector General of Upper Canada. In 1850, another Society was organized in Hamilton, Ontario, and by 1863 there were seven Horticultural Societies flourishing in Ontario from Kingston and Peterborough in the east to Paris, Ontario in the west. By 1864, six more were organized in centres including Armprior, Godrich and Guelph, and by the turn of the century, there were 46 Horticultural Societies in Ontario. The federation of these Horticultural Societies was undertaken on November 9th, 1906 when the Ontario Horticultural Association was founded. The Ontario Horticultural Association is the parent provincial representative for all Horticultural Societies in this province. 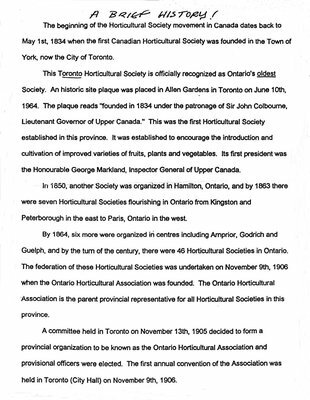 A committee held in Toronto on November 13th, 1905 decided to form a provincial organization to be known as the Ontario Horticultural Association and provisional officers were elected. The first annual convention of the Association was held in Toronto (City Hall) on November 9th, 1906.